The transient relaxation in the energizer bunny winter of 2013-14 is occurring this week, with temperatures liable to soar through the 40s and possibly 50s for Friday. However, like all warm periods this winter, we have been able to see the beginning of the next cold outbreak as the warmth moves in. And so the coming 10 day period is a microcosm of our winter’s progression to date, one which featured strong polar/arctic outbreaks interspersed with sharp yet temporary spells of mild weather. The reload is actually occurring during the thaw, as global indicators once again resume their base state of the winter. Those who were hoping for the current shot of warmer temps to carry over into spring will be disappointed, but don’t fret, spring will come eventually (the question is when exactly). Since November, the EPO has been strongly negative, and we’ve seen the results of that with a powerful Alaskan block which effectively shuts-off the Pacific-maritime flow into the CONUS. As discussed from earlier in the season, the negative EPO would provide the impetus for driving Siberian air into North America regardless of the magnitude of blocking (lack thereof) on the Atlantic side. We’ve clearly seen how the EPO has been able to dominate the pattern even with a +NAO, much like we saw in 1993-94, 2008-09, and 1983-84, a few of the main analog years for this winter. 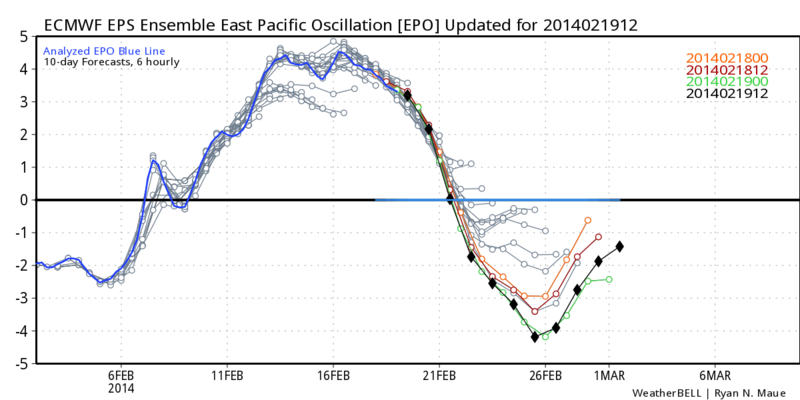 Going forward, there is strong model consensus on a tanking EPO by February 25th. Every time we’ve seen a significant dip in EPO values to -2 to -3 standard deviations or greater, an arctic outbreak ensues for the USA. This case will be no different. Over the next 5 days during our thaw, the mid level ridge in the north pacific will burgeon northeastward into the NW Territories of Canada, building atmospheric pressure there, and initiating the process of seeding southern Canada with bitterly cold air. That air is poised to enter the CONUS this weekend, and by early next week, will encompass the entire northern USA. That arctic air will set the stage for potential short waves to eject and attack the airmass (by mid to late next week). 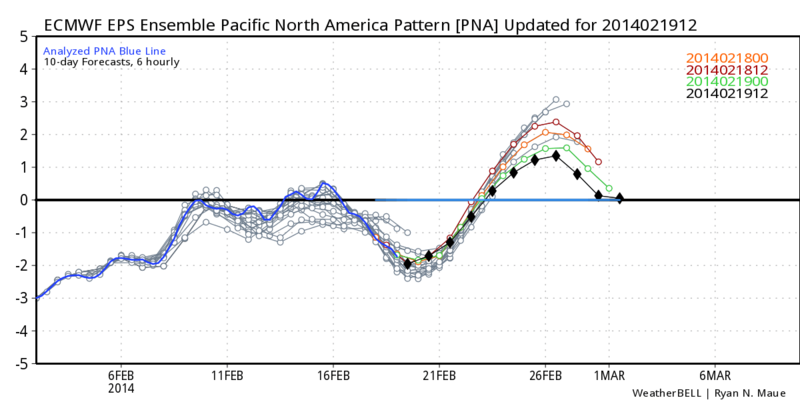 The PNA will be surging positive in concert with the EPO dip, suggesting that the mid level amplified ridge will extend eastward into the PNA domain of the Western USA. This poleward mid level ridge should extent well up into the Arctic, forcing a negative AO at least temporarily for late February. The NAO modality is less certain, but some guidance depicts height rises pushing southward into Greenland by the final few days of February. 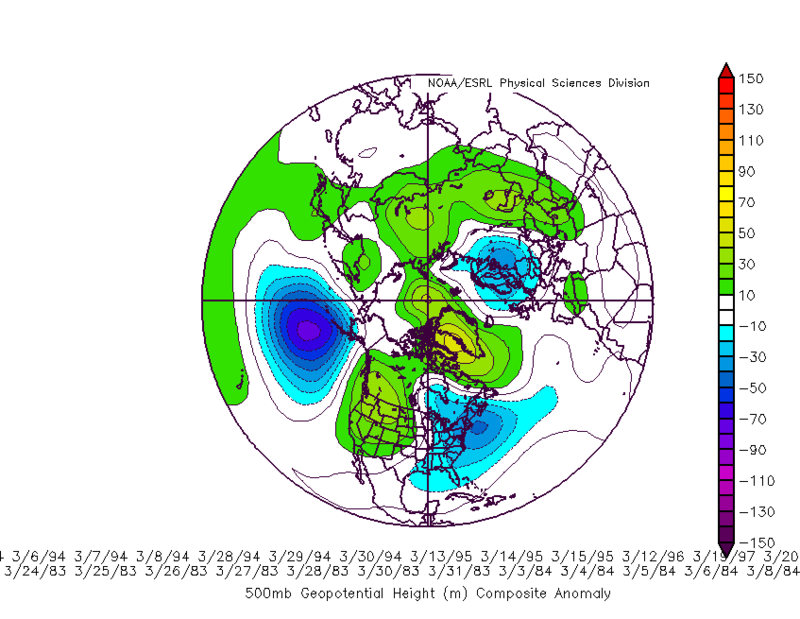 A couple of strong analogs for the upcoming 10-15 day period are Feb 25-March 10th of both 1980 and 1984. 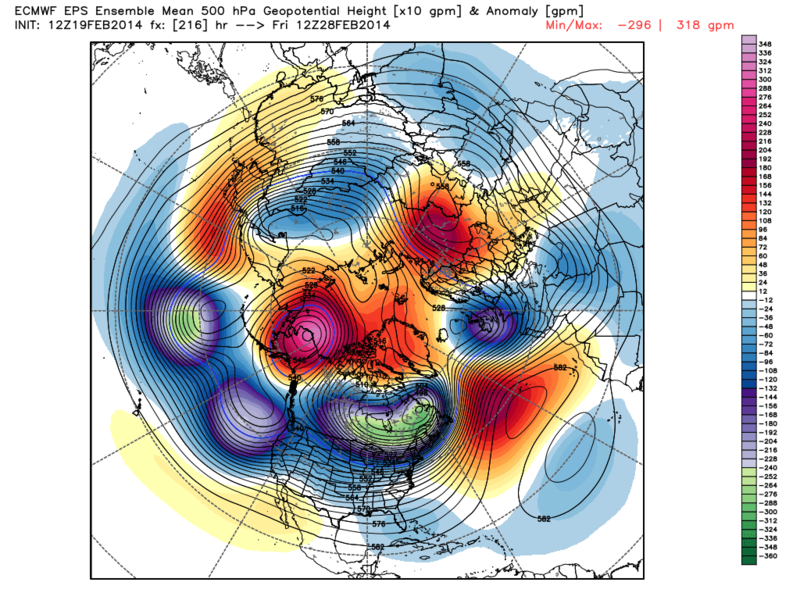 These years featured a similar, anomalous EPO/PNA pattern with the downstream powerful troughing in the Eastern US. 1984 had higher heights over Greenland which yielded even colder temperatures for the NYC area. For reference, March of 1980 had about 6″ of snow in New Brunswick, NJ, and March of 1984 had 16.5″ there. Of course analogs are only used as guidance, and those exact totals won’t be repeated. But if the expected pattern develops, we should expect another bout of significant wintry weather on at least one occasion from Feb 25th through mid March. In terms of specific storm threats, the first time frame of concern is shortly after the arctic air arrives, around the middle of next week (168hrs, Feb 26th). The ECMWF ensembles depict an anomalous, positive height anomaly near Alaska, with the Polar Vortex sitting near Hudson’s Bay. Greenland heights are slightly positive for mid week – not very impressive – but certainly favorable enough for something moderate to significant. The regime for mid week doesn’t look too dissimilar from what we saw in early and late January this year. Currently, guidance is all over the map for this threat, but the greatest caveat at this juncture is the potential for a suppressed / out to sea solution. The PV placement is not bad, and there is a departing 50/50 vortex. However, given the amplitude of the EPO, it’s possible the baroclinic zone is shifted a bit too far south for our area for the mid week storm threat. Keep in mind this is what’s progged right now. If we see a trend toward a slightly less suppressive pattern and/or the PV oriented further NW, heights would be able to rise in the Southeast USA, thereby allowing surface low pressure to come northward. I would monitor the placement of the PV in Canada as a clue to where any short wave will go for the middle of next week. But as it stands, there is a legitimate storm threat around the 26th (168hrs). Further down the road, of course uncertainty increases, but there is another storm threat near the end of February/beginning of March (240hrs). Right now, the northern hemispheric blocking looks to maximize just prior to this period, with height rises possibly extending down through Greenland forcing a transient -NAO. Another variable to throw into the equation is tropical forcing. Most models of the Pacific MJO wave propagating through octants 6-7 and eventually 8 in a week or so. If correct, this would be the first phase 8 MJO wave of the season. The caveat is MJO forecasts are notoriously poor beyond 5-7 days. With that being said, model support is certainly there for its occurrence. Regardless of the MJO wave, the cold pattern is returning for late Feb and the first half of March. But if the phase 8 MJO comes to fruition it would help activate the southern stream and increase our chances for a strong short wave attacking the arctic high over the Northeast. Translation – big storm opportunities would increase with a phase 8 MJO. The March 500mb composite for phase 8 MJO is as follows. 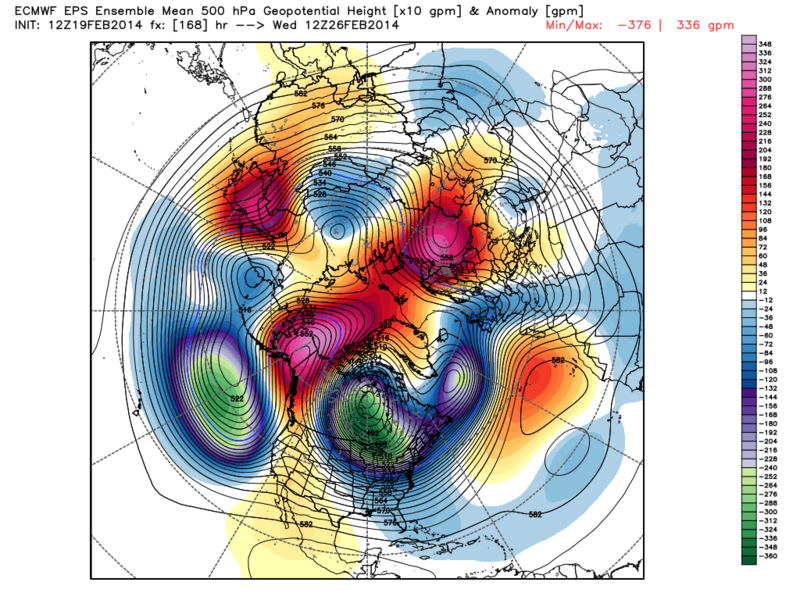 It would help to promote more NAO/Greenland blocking. 1. Transient pattern relaxation in progress. 40s by day, 50s likely for some on Friday in advance of the cold front. The weekend should be nice with seasonably warm temperatures in the 40s. 2. Negative EPO / Positive PNA induced arctic outbreak arrives by early week, with temperatures much colder than normal for the last 3-4 days of February. 3. First storm threat 26th (168hrs). Biggest caveat is PV positioning and potential suppression to the south. 4. Second storm threat around the 28th/1st (240hrs). Biggest caveat once again is suppression in the upcoming pattern, as high latitude blocking will be quite strong. 5. NAO help in the form of Greenland height rises is possible for mid to late week, especially if the MJO cooperates and progresses into phase 8. 6. Analogs such as 1980 and 1984 suggest a continuation of the Eastern trough, and probably colder than normal March pattern on the way. 7. Snow threats are far from over for this winter season. Records of the top 3 snowiest winters could be in reach for NYC.